Thursday, December 5th, fast food workers at the Smithsonian in Washington D.C. walked off the job to protest for a higher minimum wage. 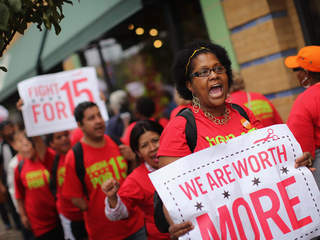 They are pushing politicians to more than double the federal minimum wage from $7.25 to $15.00. Democratic lawmakers are in turn pushing President Obama to sign an executive order to make all companies that contract with the government pay a “livable wage,” a figure dictated by the government. For his part, President Obama has gotten behind a bill that would raise the minimum wage to $10.10 and peg it to inflation. Liberals are dubbing this the fight against “income inequality.” Their marketing scheme–that is the fight against “income inequality”–is simply genius. Americans hate inequality, so whether its social issues (marriage) or economic issues (minimum wage), making your side look like the one fighting against it appears noble and just. Worth more? Not according to a free market. Propaganda aside, what does this mean for the poor in America? Minimum wage is a major pain for the poor. How can that be? How could it be that forcing businesses to pay a “livable wage” to hourly employees possibly be bad for those employees? Well it’s simple really. If you held employment constant, it would be great, but that’s simply not the case. Employees remains employed only so long as they create more value than their wages cost their employer. If an employee creates $10/HR of value for the business, he can be employed for a maximum of $10/HR. As soon as the minimum wage exceeds that amount, their employment becomes a negative for the company. Thus is figures that an increase in the minimum wage from $7.25 to $10.10 would cause everyone who generates between $7.25-$10.10/HR of value to lose their jobs. It’s a populist policy that is thoughtless and economically unsound, but a hit with low-information voters, and they are running the country these days. Check out the video below, it explains the dynamics to a minimum wage in a clear and pithy way. Please leave your comments below or tweet me at @Ryan_Kantor with your thoughts. See just how much you could save and don’t forget to inquire about rent assurance cover.